Last summer, MIS major Emily Eicholtz worked an internship with PwC Risk Assurance in the Seattle office. 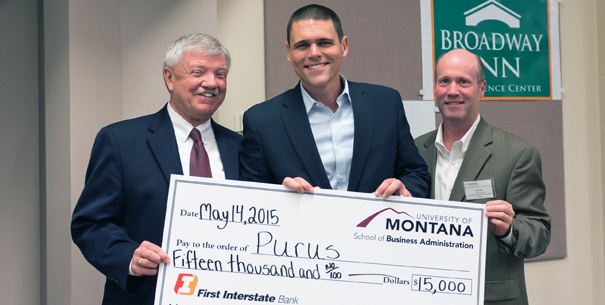 Three students received awards at the EPIC Pitch Competition, hosted by the Blackstone LaunchPad at the University of Montana, the Montana Academy of Distinguished Entrepreneurs and UM School of Business Administration on Dec. 7 in the Gilkey Building. TopManagementDegrees.com recently published its annual ranking of the top 50 most affordable Master of Business Administration programs, naming the University of Montana as No. 13 overall. The owner of the Wilma Theatre and Top Hat Lounge has formed a new regional entertainment promotion and production company headquartered in Missoula. Chris Shook, the new dean of the School of Business Administration at the University of Montana, was sleeping in a monastery in Spain last fall at the age of 53, trying to figure out what he wanted to do with his life. 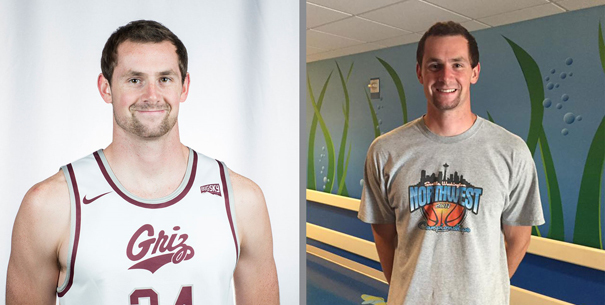 Winning the Allan Nielsen Award for the player who best represents Grizzly Basketball three times in three years says a lot about the kind of a person Brandon Gfeller is. On September 26, 2016, the new Larry and Dee Dee Gianchetta Student Success Center officially opened its doors to students. The center offers a one-stop shop for all SoBA advising, career services, graduate programs, internships and scholarships. SoBA alumnus Nate Warner launched Delete, a company fueled by $1.25 million in investment. A byproduct of Slow Ventures’ new startup incubator, Slow Studio, the company’s mission is to be the simplest way for people to donate, recycle and dispose of their unwanted items. Terri Herron, associate dean of the School of Business Administration, was chosen to co-facilitate the daylong Association to Advance Collegiate Schools of Business (AACSB) “Impact Forum” seminar offered three times a year, beginning in June 2016. Due to high demand, the SoBA scholarship application is open now through March 1. The School of Business Administration awarded 145 scholarships, totaling over $386,000, for the 2016-2017 academic year. Listen to the recorded session here! Sixteen students and 12 judges participated in the third annual scholarship sales competition, hosted by Northwestern Mutual, at the University of Montana in October. One savvy student at the University of Montana has a chance not only to win $1,000 but also to name a new student living complex. The student marketing club is very excited about a naming contest they have been hired to run by the Farran Realty Group for a new student living complex. Click here to view the finalist videos, and cast your vote by Nov. 15! Why UM and why SoBA? Last summer MIS major Sarah Beccari had an internship at Advanced Technology Group (ATG), a local tech consulting firm with national reach. 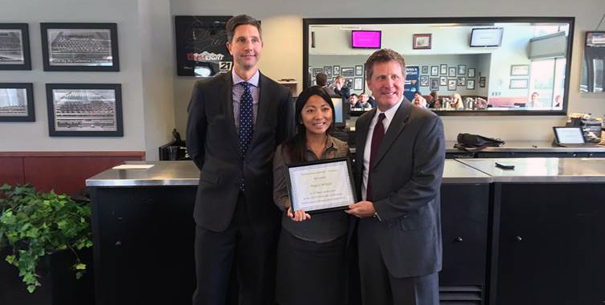 Beccari learned about the opportunity from a friend and recent MIS graduate who works at ATG. As part of their coursework, students in BMGT 402 Principles of Entertainment Management I are working on artist development projects. SoBA alumni Kristin Mickey and Carey Davis are among Advanced Technology Group's female business leaders encouraging young women to find mentors and become leaders in the tech industry. Across the globe, only 24 percent of senior business leadership positions are held by women. A mapping technology company is planning on constructing a new $2.36 million, three-story building in central Missoula with projections of adding roughly 56 new employees in the next two years. UMEM student Jesse Schuster scored an exciting internship with Madison House Inc. in Boulder, Colorado, last summer. The company provides unique and innovative management and booking for musical artists. It has offices in Boulder as well as Ann Arbor, Michigan, and Nashville, Tennessee. The Management and Marketing Department invites students to attend two panel discussions with UM and SoBA alumni on Fri., Oct. 14. Panel 1: “Preparing for the Future” GBB 123, 9 – 10:15 a.m. Distinguished brand experts Kevin Keller and Scott Bedbury visited the University of Montana on Thursday and Friday, Sept. 22-23. The duo gave two presentations to audiences of about 150 business students and they also gave talks to faculty and a brand workshop with UM deans. The Montana Society of Certified Public Accountants and the University of Montana’s Beta Alpha Psi hosted about 40 students attending MSCPA’s Opportunity Night at the Holiday Inn in downtown Missoula. UMEM is looking to fill Stair Sessions for the next two Thursdays (Oct. 6 and 13)! It's a short 10-minute gig and a fun opprtunity to showcase your talent. Shoot them an email at UMEM@business.umt.edu. Open to all types of music! Dean Chris Shook, Executive Education Director Kate McGoldrick and Bill Whitsitt participated in Northern Broadcasting System's live radio show series Voices of Montana last Friday morning. Listen to part one and part two of the show here. This year’s Meet the Firms event was held on Sept. 20 on the main floor of the Gallagher Business Building. The new Larry and Dee Dee Gianchetta Student Success Center in the Gallagher Business Building opens for business on September 26, 2016. Congratulations to Assistant Professor Lisa Eiler on her latest publication entitled “SEC comment letters related to permanently reinvested earnings,” which is published in Advances in Accounting. MIS major Mike Ralston took a whirlwind trip to Dublin, Ireland, last summer for KPMG’s Global Advantage (GA) program. The GA program is a three-day training for future KPMG interns that focuses on some of the key attributes of a successful KPMG professional. Northwestern Mutual is hosting a Scholarship Sales Competition for all UM undergraduate students in partnership with Blackstone Launchpad. This is a unique opportunity to combine academic knowledge with interpersonal skills and professionalism to compete against other top students. The School of Business Administration’s general-use computer lab in GBB 209 has new hours. It is open from 7:30 a.m. to 9 p.m., Monday through Friday, and 10 a.m. to 8 p.m. on Sunday. The lab is closed on Saturdays and holidays. Welcome to our 2016-17 graduate assistants! They are David Brewer, Bryn Christopher, Xiaoning Cui, Hannah Doerner, Tatum Hoehn, Tyler Leslie, Madisen Overholtzer, Olga Voevodina, Emily Weaver, Miles Wetzel and Jessica Wyrick. When Blind Melon's "No Rain" came out in 1992, some people in the music industry thought songwriter Brad Smith was "an overnight success." Dean Chris Shook looks foward to meeting SoBA alumni and friends for jambalaya and cold drinks prior to each University of Montana Grizzlies home game. We are located between the Washington-Grizzly Stadium and the Clark Fork River in Tailgate Space #13. SoBA alumna Beth Atherton recently won InsideNGO's Practitioner Excellence Award for Finance for her work as finance director at Nuru International, a non-governmental organization that works to end global poverty. Join us during wintersession as we explore the outstanding landscapes and generous peoples of New Zealand and visit the thriving commercial center of Sydney, Australia. Info sessions for the New Zealand-Australia study abroad start next week: Sept. 6, 7, and 8 at 4 p.m. in GBB 119. Angle says Montana taking on the brand of a last best place in the West means some wildness is expected. Things are going to happen that no one can predict, and Angle says the brand should embrace that, with nuance, telling that story while keeping the positive associations of the landscape. Plan ahead for Spring 2017! SoBA graduation and major applications are due on Sept. 23. Please see Moodle or the SoBA Advising website to submit your application. Contact SoBA advising at sobaadvising@business.umt.edu or 406-243-5971 with any questions. A voracious fan of Rocky Mountain big dumps, alpine skier Kelly McBroom has dropped into more bowls than anyone in the Bow Valley. Now, she's turning her excitement over double entendres into a business with the creation of Big Dump Plungers. The School of Business Administration (SoBA) IT staff work to meet the changing needs of staff and faculty and to deliver the best in-classroom and online experiences for students. The entire Bitterroot Valley community was affected by the Roaring Lion fire near Hamilton. Numerous structures were destroyed, and over 500 homes were evacuated. As a result, an overwhelming number of horses needed food and shelter. Jenae White is a business major with minors in communication studies and biology. In this blog post, White shares a bit about herself and her experience as an assurance intern at Moss Adams San Francisco office this summer. The Summer Olympic Games are underway in Rio de Janeiro, Brazil, and millions of people around the world are watching with bated breath. Derek Duncan, a 2009 University of Montana marketing graduate, is among those excitedly following the events. Michael Gill, a University of Montana Entertainment Management alumnus, is bringing a music festival to Missoula this September. We are pleased to announce that Dr. Christopher Shook joined the University of Montana as Dean of the School of Business Administration (SoBA) on July 18. For the past 27 years, a group of young entrepreneurs has gathered in the spring at the University of Montana in Missoula to showcase their business ideas.